Experience the power of the moon against the night sky – in your home. This Levitating Moon is exactly what it sounds like – and more. Specifically, more than just around white light. It's designed to look like an authentic mini replica of the moon's real topography, with craters, crevices, and shading. It's even built with three shades of soothing colors red, green, and blue. 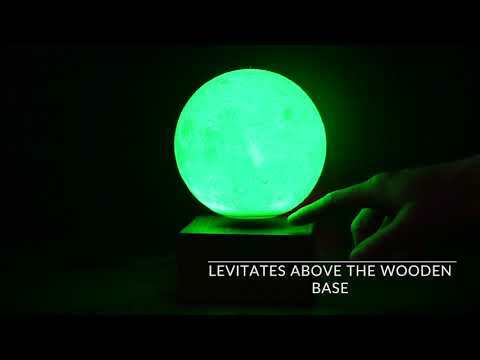 This illuminated moon can levitate above the wooden base which has a battery so you don't need to plug the device anywhere and use it on the go. This lamp is made by innovative 3D printing technology, layer by layer stack, which restores the real appearance of the moon.